The Opposite House is pleased to present “Sky Mansions” by Ding Hao. A graduate of Central Academy of Fine Arts, Ding Hao has gained numerous national recognitions. “Sky Mansions” may be viewed at the hotel’s Atrium from now to the end of March 2017. 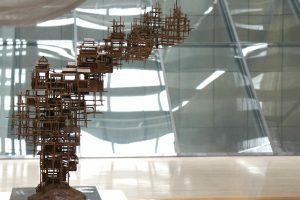 Composed from iron and wood, “Sky Mansions” presents striking art pieces named “Whereabouts”, “Gone City”, “Hanging Ladder”, “Bend Moon”, “Dazzle City” and “Babel Tower”. 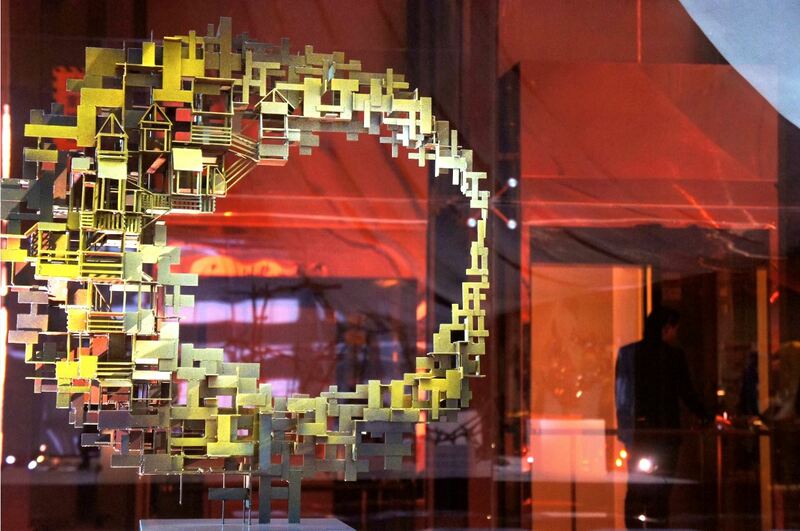 Each piece was inspired by combining elements from Chinese classical architecture with modern space construction. The small buildings and houses are on top of one another, depicting a construction method that does not exist in reality. The layer upon layer of buildings and houses fuses illusion and reality together. The Opposite House has long collaborated with Red Gate gallery to present contemporary art installations, which get updated quarterly.